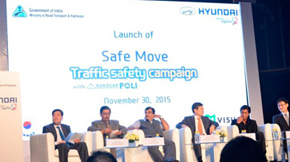 Asset’s (ACT) latest account acquisition is Hyundai Motor India Ltd. and the first mandate given to it was to launch their global Road Safety campaign – “Safe Move – Traffic Safety Campaign with Robocar Poli” in India. The campaign backed by the Ministry of Road & Transport and Highways, Government of India, is specifically targeted towards children, considering they are the future and the best time to imbibe life discipline in them is early and mid years in school. 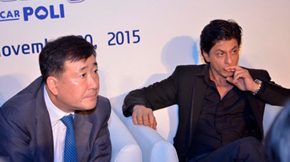 Mr. Y. K. Koo, Managing Director, Hyundai Motor India Ltd.
• To develop a road map and recommend a program in conformance with the CSR mandate. • Identify, evaluate, monitor & report on the complete program across all touch points & present the same post the activity. 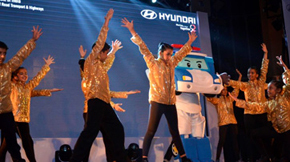 • Use Hyundai’s available Assets and create relevant new ones, to help better connect with the Indian Audiences, especially children from 6 to 12 years of age. • Execute the Launch Event. 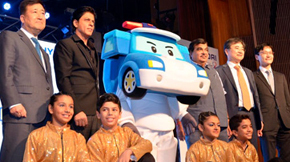 • Leverage Hyundai’s International Mascot, RoboCar Poli along with the Global Content on Road Safety that should run on a popular satellite network targeted towards kids. • Target children, continuously engage and constantly monitor plus evaluate the project to maximize the impact. • Launch in Delhi with Ministry, School Principals, Dignitaries and the Media at the Indian Habitat Centre on November 30th 2015. • Post Launch Phase 1: Target kids & parents across 5 cities through a School Contact Program & Residents Welfare Associations activation. 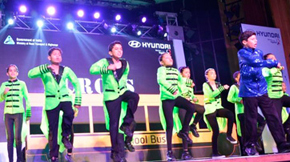 • Ace choreographer Shaimak Davar’s junior troupe performed on a 7 minute medley especially created with Road Safety lyrics. 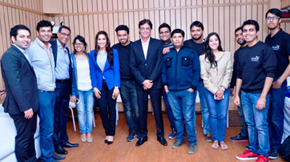 Shiamak also choreographed the signature step which will help all kids recall the campaign and message. 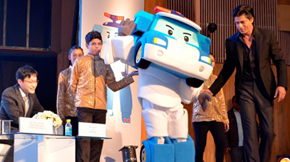 Robocar Poli, the campaign Mascot is a part of a 26 episode cartoon series which was launched along with the DVD pack of the same. Each episode covers a different safety message and is running daily on Hungama TV. • Target Cities included : Delhi, Mumbai, Ahmedabad, Kolkata & Chandigarh. • 40 Schools & 45 RWA targeted in Phase 1. 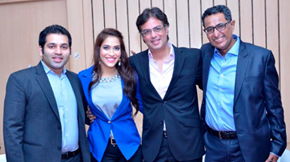 Project roll out and completion – Jan ’16. • Interesting content developed including a 7 minute English + Hindi Safety Song, a signature step for kids to associate with the Mascot & the Campaign, a 3 minute story telling audio script embedded with key messages, the ‘TRuDO’ game – an extremely promising edutainment tool to engage with kids of all ages and various other impactful compositions that would ensure deep impact and behavioral change within the target.